To reflect, rest and to take off again. Welcome. Let’s get introductions out of the way. Don’t forget to tell me a bit about yourself too. I Write, I Speak, I Engage passionately mainly with the disadvantaged, the hurt and the socially struggling one who is seeking true redirection and support to discover hidden potential and to recover from the ravages of life. Iron sharpens iron. Great minds ignite one another for the greater good. I am happy to have you here. 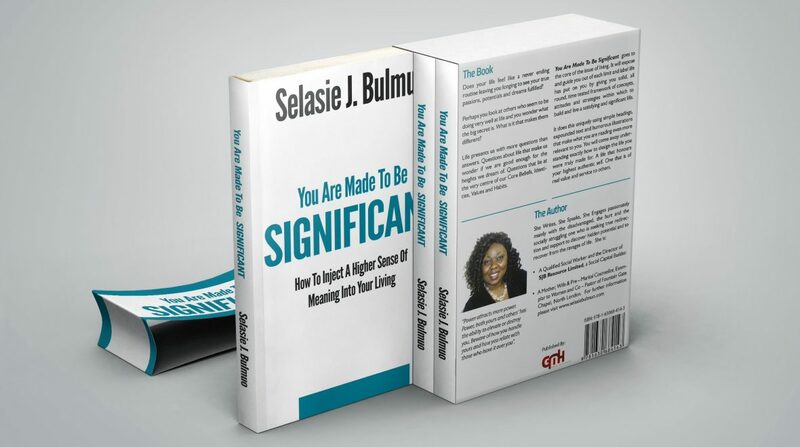 I am Selasie Bulmuo – a Strategist For Insightful Living. I am absolutely thrilled to welcome you to my E- home full of lovely, deliciously ‘good for you’ inspired ideas, resources and opportunities to connect with others. On this site you will find relevant information, uplifting writings and resources that are designed to captivate your senses and leverage your efforts towards becoming the best you. Enjoy your visit here. Read! Challenge yourself! Think! Invest! Also visit my Facebook page http://www.facebook.com/SelasieBulmuo This page is an E-Hub of wisdom, spirituality, posters, quotes, messages and social synergy aimed at providing the inspiration and support you need to steer your life back into the right track. Selasie Joan Bulmuo – Who is she? What does she do? • She is a Qualified Social Worker and Director of SJB Resource Limited, a Social Capital Builder focused on the provision of services to individuals and groups particularly families in crisis. SJB Resource Ltd (www.sjbresource.co.uk) is a Social Capital Builder. Blog – http://www.socialjackpotbuddy.wordpress.com (social topical issues, articles and networking). • An Author and writer, she writes across genres and styles mainly poetry, short stories, articles, reflections, wisdom quotes, plays and songs all aimed at reaching out to others where they are and accompanying them on the journey to where they are destined to be. She also writes fiction and non-fiction books cutting across both the mainstream and Christian domains. This blog http://www.selasiebulmuo.wordpress.com mainly features her Poems, Posters (Inspirational Snippets), Smart Talk and her Fictional Works including excerpts from her books both existing ones and soon to be released ones. Selasie is a mother of two boys and a daughter. • A Qualified Social Worker and the Director of SJB Resource Limited, a Social Capital Builder. • A Mother, Wife & Pre – Maital Counsellor, Examplar to Women and Co – Pastor of Fountain Gate Chapel North London. • The author of ‘Warm Honey Drizzle & Lemon – for my blocked up soul’ a collection of poems with accompanying graphics and short fictional stories that mimic real life triumphs and tragedies; experiences to which others can relate and see their own stories and lives through. A reaching out book soon to be published. True Love Gives and gives and gives and gives and…………. Is Beauty Gone With The Wind? The day it entered this place called earth. So no one loves you now, Perhaps they don’t. And depressed when I am not. Which one is the route for my lifelong pursuit of Happiness.